The charts are graphical representation of your data. It represent mostly the relationship between two variables x and y where variable x is independent variable and variable y is dependent. In the Microsoft Excel such charts are called - Scatter plot. There are 3 things related with chart format I will be looking for and ... you should keep in mind. Chart title. It explains the process or the relationship between variables. Bad example - "Concentration and absorbance"
Better example - "Concentration versus absorbance"
"The relationship between concentration (independent value) and absorbance (dependent value)"
"The dependence of traffic ticket cost and car speed"
Axis titles. Each axis have its own variable. Legend. Chart can have more than one data-set. How to distinguish data between each other? Series 1, Series 2 ..
Is everything`s fine in this chart? How to study? How to search info? Short answer - google for it. And the word "google" here is meant to be a verb. It is usually defined as not very good resource of any kind of info. It is often called a pile of .. let`s say polite - "excrete". But some valuable pearls can be found inside of it. You just have to learn to see and fine them. Search engines. I suggest Google. Define the keyword you are looking for. Try to figure out at least few keywords from the topic you`ve been given. Think about synonyms, maybe there are some other ways how to define chosen keywords. Add the word "explained" together with the topic. For example - "luminescence explained" could give you more sophisticated and better results than "luminescence" alone. File-types. There is more about Google. You can specify the file-type. There are a lot of presentations accessible online and presentations usually contain nice schematics, images and most important text related with the topic. How to search for specific file-types? Add filetype: and the 3-letter file abbreviation. For example - electrocardiography. How about specific scientific paper you should pay $$$? Maybe full version is already uploaded somewhere online? Let`s try - Efficacy and safety of tap water iontophoresis for palmoplantar hyperhidrosis. Or maybe some free mp3`s? Sometimes the info can be misinterpreted by the author or just incorrect. Especially, the non-english wikipedia. There is one good thing about Wikipedia - it can give you following suggestions what to look for; remember - when you are reading wiki-articles; keep this thought in your mind - "What keywords are hidden here I could look up?" More resources? In the slideshare.net you can find plenty of lectures. You only need... keyword! Even more resources? coursera.org is... awesome! It has free high quality online courses available (about almost everything). The only issue is - you have to wait for course to start and all materials will be released gradually during the overall length of chosen course. Short summary here - books and scientific journals and teacher`s materials. It turned out that plenty of books you can find through... internet. Legally. e-studies. Check it out! Start with course topics and description. University must have defined the main literature. If you cannot find it, ask your teacher for it. University electronic library. Universities often have access to online libraries. IMO The Google and Youtube are the best teachers in the world. You just have to learn ask them proper questions and filter their answers. There is no excuse of not having materials in my classes. It is called laziness and unwilling to google.. err.. I mean - to study. My criteria for accepting Your laboratory work. Ideally, Your lab work should consist of three main parts. You can always convert those measurements back to basic units using the power of the MS Excel (or other modern spreadsheet software). Finally, apply necessary physics formulas. Most common basic units are meter, kilogram, second, Newton, Joule. If you measure distance with micrometer, write down numbers what you see on the device as they are. Do not recalculate them to meters in your mind; in such case you allow yourself to have higher probability having gross errors - mistakes. Let`s say, you have measurement - 5 microns. What is the formula to recalculate value in basic units? You multiply it with 10 in power of what micron is for the meter. Micron is 0.000001 of meter or 10 in power of -6 meter. Final formula is - 5*10^(-6). Avoiding do such recalculations allows you to escape having mistakes where you forget to write (or add one extra) zero. Use the force of the excel instead of your pocket calculators; even more, instead of rewriting that measured value 5 microns in the formula use (point it to) the cell address. And in the last step where you have to apply necessary formula - use same excel power. Report is most representative part of your laboratory work. Everything here must be properly formatted and represented. That mean, it must be written in the text-field. I prefer students having all data and lab work report in one spread-sheet file; that mean report must be written in the textbox. In MS Excel you can find textbox under "Insert->Insert textbox". Language as one of important aspects as well. You have to use proper grammar, logical and fully written sentences. You have to define the aim of the laboratory work. Ask yourself - what you are trying to achieve? What is the goal of it? What are the practical results you want to find? What is the meaning of it? Then you have to give short insight about applied methods and explain performed tasks. What kind of methods can be used and why? What is this physical basis behind those methods? What are steps to achieve the result, to perform the measurement? Laboratory work conclusions also can be divided. In three distinct subparts. The very first and only one sentence of the lab-work should explain what was the aim of the work. Following sentence (or second part of the first sentence) should give the result itself. It can be numerical result represented by one number or composition of statistical values; it can also be logical result in the form of "accepted/rejected", "yes/no", "proved/busted", etc. representation with following explanation - how and why there is such an assumption. In most cases this explanation can be based on regression analysis and R-squared value. 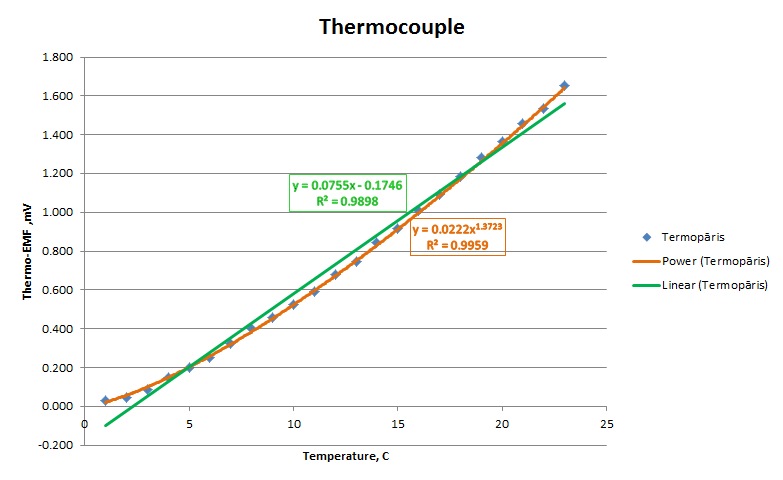 You are studying relationship between dependent and independent variables. Both cases allow (but not always) to find a mathematics behind the plotted data. In our physics lab-works the mathematics usually are linear or exponential or logarithmic. Remember, when you have a chart - think about are you able to find the mathematics behind of it (regression analysis). This allow you to prove different laws (Newtons law of cooling, Beer-Lambert`s law) in the logical sense. If you have chart with regression line, don`t forget to describe both the type of the regression line (is it linear or some other type line) and the goodness of fit (R-squared value). If you have some theoretical values given - you can always calculate absolute, relative errors and relative errors in percents (do not mix these with statistical parameters, e.g. standard error). Is relative error higher than 10%? Is the theoretical value within the confidence level or outside of it? Is regression type according to the theory or physical laws? How to deal with "E", for example, "E-09"? What is that? Well, the answer is - it is E-notation. It is the same as scientific notation. For example - An electron's mass is about 0.00000000000000000000000000000091093822 kg. In scientific notation, this is written 9.1093822×10^(−31) kg. Here in this division you have to explain two types of problems which are related with your lab work. Here is a nice list with different kind of errors. Systematic and random errors. Small note about "there is no such things as human related errors". Well, remember, what gross errors (mistakes) were and sometimes you have to evaluate the results based on your senses. Altogether I suggest to split this division on two separate subdivisions explaining 1) physical system related errors (objective errors) and 2) human factor (subjective errors). Define practical problems and think - is it involved to create a systematic or random error. Make sure that here some additional questions might be asked. Charts are as much important information source as lab work report itself. See here what criteria I am asking about chart formatting from my students.